You can add to or remove existing projects from a multi-project at any time. 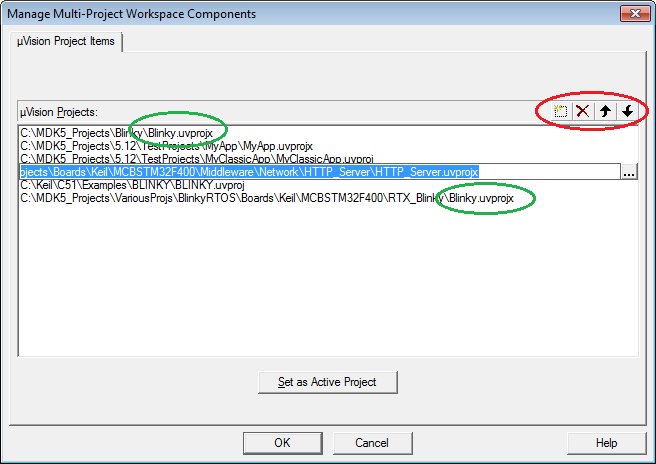 The toolbar button or the menu Project - Manage - Multi-Project Workspace... opens the dialog. With the buttons on the top right corner you can add, remove, or change the order of projects. The project order influences the compiling, linking, and assembling sequence. A project must be Set as Active Project to work on that particular project. 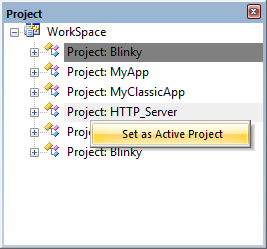 As an alternative, a project can be activated from the Project window using the context menu. The active project is marked dark gray in the Project window. Removing a project form a multiple project does not delete the physical files or folders of that project. Projects can have identical names, as long as they reside in different folders.